The school is very modern, with contemporary surroundings and free online facilities. situated in a private compound and very close to the Belarus Train/Metro station. Teaching standards really were very high with experienced and qualified staff teaching expatriates from around the world. The courses were stimulating and tailored to my linguistic level. The use of all mediums helped me appreciate the complexities of Russian language, and each 50 minute lesson was fun, making the grey matter buzz far more! 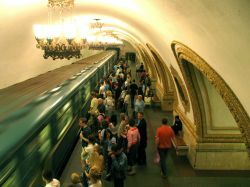 Don’t miss the Moscow Metro! Ever seen a tube station with crystal chandeliers hanging down from the roof? I have! One of my favourite places in the world is Moscow. There are many reasons to love this fantastic city: the people on the busy Tverskaya shopping street, the small shops selling hot pirogs, the amazing Red Square and the delicious Borcsh you can eat late of an evening in one of the local restaurants.